This is my geranium today. I have looked after this plant for 14 years. It has looked better, and it has looked worse. It has always been loved, if not always appreciated. My daughter gave this geranium to me when she was in 2nd grade. Each year at Mother’s Day her grammar school would have a plant sale and the children were encouraged to purchase a plant for their mommys for Mother’s Day. One year I got a yellow gerber daisy. It and I did not have a long relationship. Then the next fateful year, she gave me my geranium. Until this geranium came into my life, I was no great lover of geraniums. I’m still not, but I have learned to appreciate them for what they are. Too common, I thought, too splashy, too easy. I was a plant snob, on the hunt for the rare, the unique, the unattenable. But then this geranium was gifted to me. And, like a white elephant, I was honor bound to love it, nourish it and keep it alive! It has had several near death experiences. Once or twice (or more) I left it alone when we went on vacation. Upon our return there would be a shriveled brown stump with a leaf or two hanging on literally for dear life where once there had been a happy, thriving plant. Each time emergency administrations of water and fresh soil and profound, profuse – spoken aloud – apologies always brought the geranium back to life. It was after one of these experiences when the plant just did not die that I began to look at her differently. Perhaps she wasn’t common, splashy, or easy. Perhaps she was rare and unique. She was unique in my life being the only geranium I had ever owned. And her behavoir was certainly rare. She never complained, she suffered semi-constant abuse at my hands, but she always came back for more. Given just the barest modicum of TLC and she would bloom and grow and be so beautiful even calloused workmen who saw her in my kitchen commented on how beautiful she was. Who could ask for a better companion! I wanted others to experience the joy of owning such a plant. The Geranium Project was born. 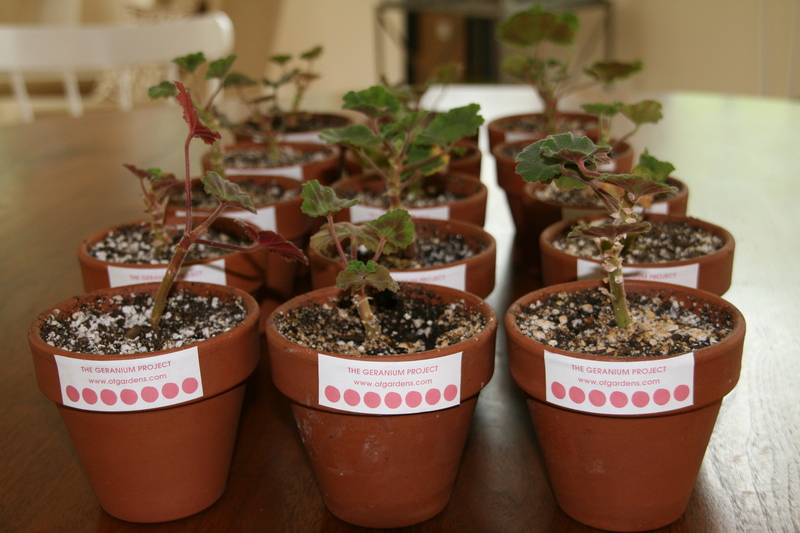 The Geranium Project is the name I gave to my efforts to propagate and distribute my geranium. 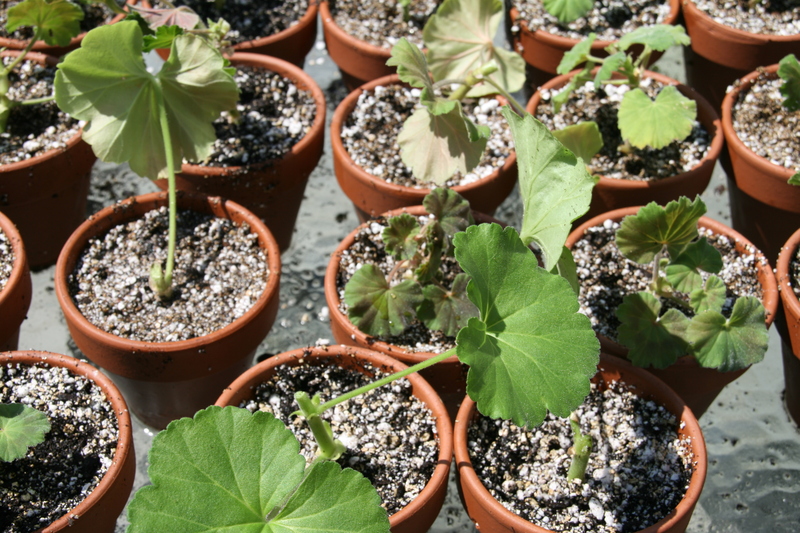 Five years ago I began to propagate my geranium. From a small cutting I grow them into plants and give them away. I have given away so many geraniums that I can not remember everyone I have given one to. I am often delighted when someone mentions that the geranium I gave them is alive and well and giving joy. Today is a first for The Geranium Project. A friend of mine asked me to make 25 cuttings so she could distribute them at a workshop she is giving. I was touched and thrilled to think that 25 more people will have the pleasure of having this geranium in their lives. I hope it gives them as much joy as it has given me. The timing of this request gives me special pleasure because this is Mother’s Day weekend, the same weekend that my daughter first gave me my geranium so many years ago. To celebrate these events I would like to offer a geranium cutting to any reader who would like one. If you would like to participate in The Geranium Project by receiving and nurturing a geranium of your own (and perhaps one day of propagating them and spreading the joy), please tell me and I will send you a cutting. Happy Mother’s Day. We can all be mothers of something, even if it is a geranium. I am the proud recipient of one of the baby geraniums. Despite the somewhat erratic care I have bestowed, my geranium is thriving. Looking forward to bringing her outside for the summer. Thanks! 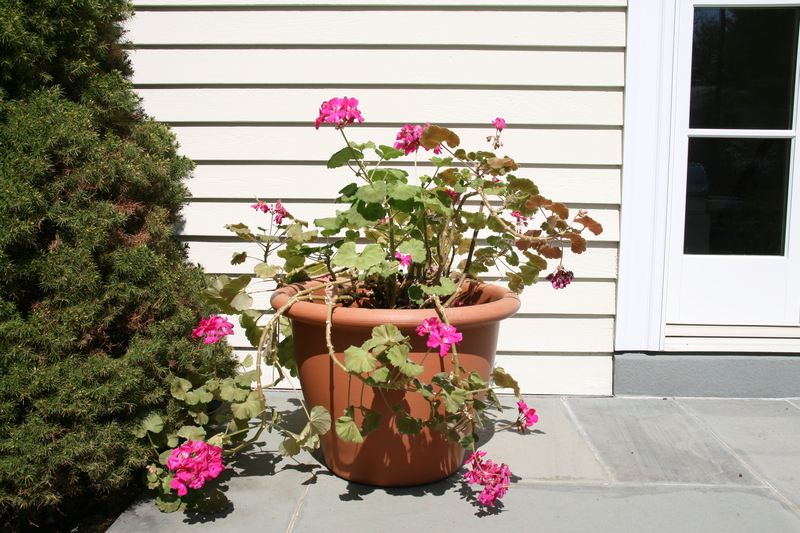 Glad to hear that your geranium is thriving! BON VOYAGE…may there be a Dancer in your trip! Having received a geranium from the Mother Geranium I was thrilled to pass on 25 babies to people in the workshop today. I wish you had been there to see their responses, their gratitude. Here’s to spreading goodness! You have been busy…writing and planting (and raising daughters). Your writing is beautiful, Amy, as I remember it from college. Keep up all this growing. I applaud you! And I have a question. 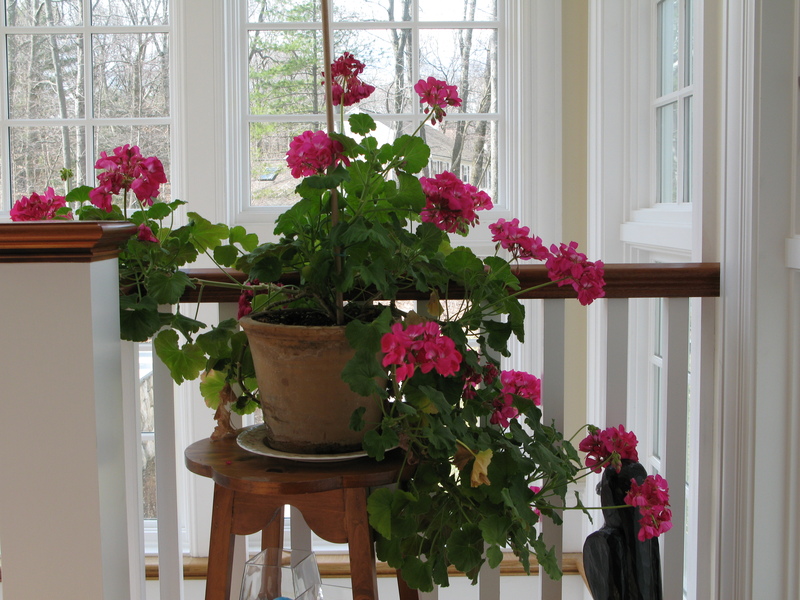 I have geraniums in boxes on my balcony, kept them alive through the winter, and as spring offers some light and heat, they are blooming again, but not like they did a year ago. The buds are smaller. The results less vibrant. Any hints on how to revive after a long winter? Welcome to Of Gardens! Thank you for your kind words. I would replace all the soil in your boxes with fresh, new soil. By now it is probably that the nutrients in your soil are depleted. Good luck with your geraniums. This is a great and romantic story and I would very much like one of your geraniums, although since I travel so much it is really not practical, but I will carry a baby geranium in my heart I think, and imagine giving my imaginary propagated future generations away like you do. I do hope that the lucky recipients of your geranium offspring will be invited to read your blog and that some of them will be interested enough to become blog subscribers too! I expect it is some violation of international law to export your babies, but wouldn’t it be wonderful if you could somehow get the offspring to people in conflict areas -climate permitting of course. Maybe it can replace the olive branch one day as a peace symbol? Also, it is so much better that you give them away and not sell them – and maybe you can encourage the recipients to do the same, perhaps by providing each of them a link to your blog and posting the propagation and care instructions somewhere? Oops, must get back to the salt mine. I love it! Great idea! I would love to nurture a geranium and maybe even spread some cuttings on to friends once I can help grow the little extraordinary being onto thriving maturity. I wrote this poem inspired by geranium a little while back around Easter…. and I lean towards the divine. and roots are anointed with Neptune’s fish fertilizer. She grows and grows turning with the hand of each new day. Fragile terracotta cracks and splits. Transplanted geranium returns to her wild garden. The “Sweet Mimosa” buds are drunk in by the brunching light of Easter Sunday. in a living bed that knows no fragile edge. and she sings alongside all the flowers of the field. “Barr’s Purple” crocus makes the wasteland rejoice as it becomes aware. Hyssopus officianalis releases its official spirit. Geranium waits for the summer sun to blossom fully. If it’s convenient for you I could pick it up this weekend. Just email me. Thanks again…really cool idea! No worries. Enjoy your travels, the pictures are beautiful! “Charmed” is a lovely word! I like being associated with it.